TheTownCrier: GOP Snakes making $$$ off Trump as they try to destroy him! Donald Trump's best quality? HE LISTENS! GOP Snakes making $$$ off Trump as they try to destroy him! Okay, this really annoys me! And it should you, too! You're on Facebook and there is a poll from NRCC...who won the debate, Trump or.....? When you vote for Trump, this happens! "Our records indicate you have not taken a stand against the presumptive Democratic nominee, Hillary Clinton. In order to get Trump elected, we’ll need conservatives to band together against Hillary. Are you in?....So show your support for Trump by saying Hill No! to Hillary Clinton." This is National Republican Congressional Committee selling 'stop Hillary' merchandise giving us the idea it's for Trump. IT IS NOT! Trump will never see a cent of this! More NASTY GOP cheating! When you answer one of their FaceBook questions about who you will vote for, you get this scam! The problem is all the people who will buy the stuff believing they are helping Trump. And there are plenty or the NRCC wouldn't bother. Making $ off Trump while trying to destroy him...smells like Grover Norquist to me! Quote: The NRCC is governed by its chairman, U.S. Rep. Greg Walden (OR-02), and an executive committee composed of Republican members of the U.S. House of Representatives. House Speaker John Boehner and the seven other elected leaders of the Republican Conference of the House of Representatives serve as ex-officio members of the NRCC’s executive committee. THIS ONE SURE SOLD OUT! Thanks for zip, Walden! Trump missed the Heritage Foundation event on Friday...I HOPE it is because he realizes they are part of this GOP SHAM. TTC has told you before that Steve Moore, head economist of the Heritage Foundation is the biggest open border/amnesty HACK around, joined at the hip with Grover Norquist, Karl Rove and Cesar Conda, who is Rubio's chief of staff! Wake up America! Your 'conservative' NON profits do NOT EXIST!!! It's all a sham! UPDATE Oct. 15, 2015: This morning on The Bill Meyer Radio Show, Bill asked Cong. Greg Walden about his NRCC Trump supporter scam. He flat denied it...said they never get into prez politics...well..they are NOT supposed to! Here are the email addresses....and one from Greg himself...all the same email, all the links go to NRCC! UPDATE! Well, they're not letting up...Sunday, Sept. 20, 2015. These GOP hacks are disgusting! Please tell then what you think! I did! It reads: Thanks for voting for Trump as the winner of the second GOP Presidential Debate! Now that we know you’ll be voting Republican, take a stand against Hillary by saying Hill No! to the presumptive Democratic nominee. 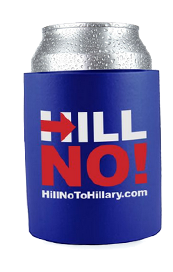 Become an NRCC Member today for just $10/month and we’ll send you these three Hill No! items for free.